This collection includes books owned by several generations of Mathers, beginning with Richard (1596-1669) and extending down at least three generations. 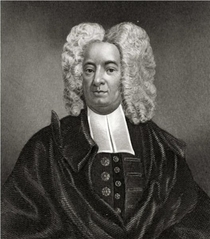 Data in the entity information below is given for Cotton Mather (1663-1728). For information on the others represented here, see the profile page. Additional titles at AAS and other locations remain to be sussed out and added. Family members each typically signed their name in the front leaves of the book. Increase Mather generally signed with his name and the date (i.e. "Crescentii Matheri Liber. Julii 24, 1682"). Other examples: ""Liber Richardi Mather: ex dono Dom. Eliot"; "Sam: Mather"; "M. Byles"